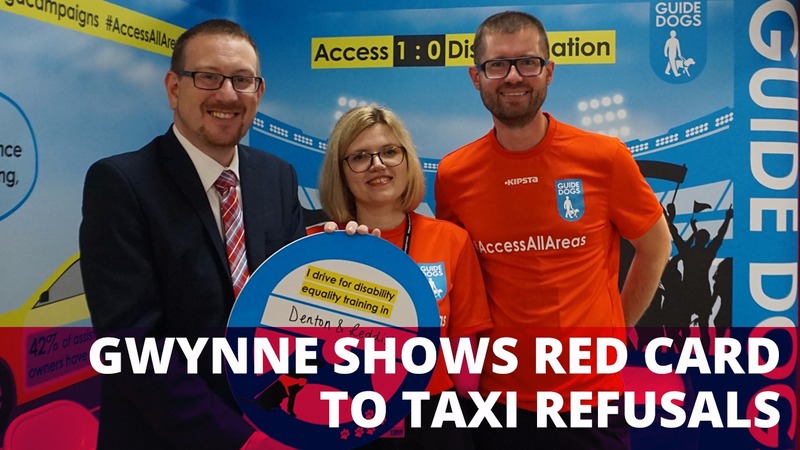 Andrew Gwynne MP has tested his taxi hailing skills at Labour’s Annual Party Conference in a football-themed game with guide dogs in support of the campaign to clamp down on access refusals to taxis for assistance dog owners. While trying to get a taxi to take guide dog owner Jacqueline to her local football match, the MP for Denton and Reddish heard about the real problems assistance dog owners face when being illegally refused by taxis and minicabs. The Equality Act 2010 makes it illegal for a taxi or minicab driver to refuse to take an assistance dog or to charge extra for carrying it. However, Guide Dogs research found that 42% of assistance dog owners have been turned away by a taxi or minicab in a one-year period because of their dog. The research also uncovered that 38% of assistance dog owners have been asked to pay an extra fare for carrying their dog. Andrew Gwynne MP is supporting Guide Dogs’ call for all taxi and minicab drivers to undertake disability equality training so they understand the rights and needs of disabled passengers and feel confident to offer assistance. The campaign is supported by more than 30 organisations, including trade bodies, local government representatives and disability groups. “I fully support campaigns to make public transport and taxi hire vehicles fully accessible for all, include guide dog owners, and persons with other disabilities. “Last year I worked with Guide Dogs UK to introduce a Bill to Parliament to make sure all taxi and minicab drivers have disability equality training, however, since my Private Members Bill we’ve seen barely any progress from Transport Secretary Chris Grayling. “Imagine you were turned away by a taxi driver for no reason. This happens to people living with sight loss with shocking regularity just because they are travelling with their guide dog. “It’s not only illegal, it knocks people’s confidence and stops them doing the everyday things that most people take for granted – going to a café, meeting friends, going to the doctor’s or to their local football match.